Say what you will about Taylor Swift and her music but there’s no doubt that she’s one of the most generous celebrities when it comes to her fans. The country star turned pop sensation has previously made the news after she helped a homeless and pregnant Swiftie find a home some years before. Now, she’s back in the headlines after another good deed done for a struggling fan. Pictured right is the Bartell family surrounding Lauriann, the ailing matriarch of the family. 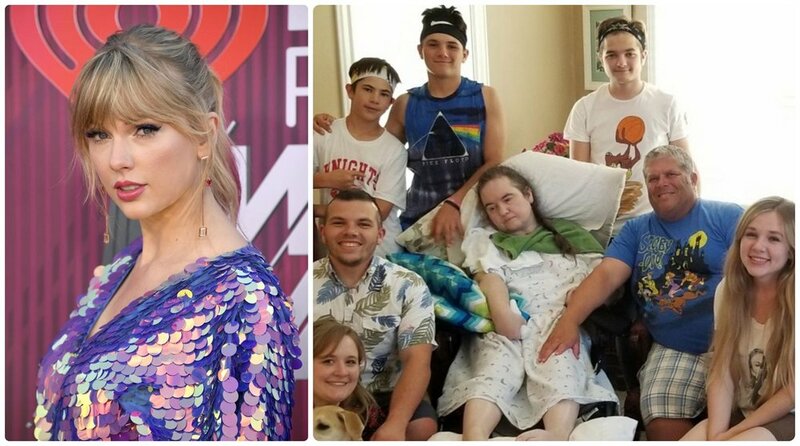 Sadie Bartell is a 19-year-old Swiftie from Orem, Utah whose family was struggling with the piling medical bills after her mother, Lauriann, went into a coma three years ago. Their money problems have come to a point where her family is threatened to lose their own home if they can’t raise enough money in time. Like thousands of other struggling Americans, Bartell initially turned to the crowdfunding website GoFundMe to ask for donations. With the throngs of people in need on the website, it can be difficult to get one’s fundraising campaign get noticed on the website. But Sadie would get an unexpected surprise after her tweet about her mother and their problems was noticed by her idol. Sadie shared her tweet just a few days before going to one of Swift’s concerts and the singer would answer by donating a generous $15,500 to the Bartells’ GoFundMe account over the same weekend. Swift also left a short but sweet message to her fan saying that the donation came from Swift as well as Meredith and Olivia, which are the singer’s pet cats. However, Sadie believes that it was a Tumblr post she made that prompted Swift to help her in her time of need as the pop star has been known to personally interact with her fans on the platform. A screenshot of Sadie’s ecstatic tweet after realizing what her idol did for her and her family. Sadie took to Twitter as well to express her gratitude for the unbelievable generosity of her idol. 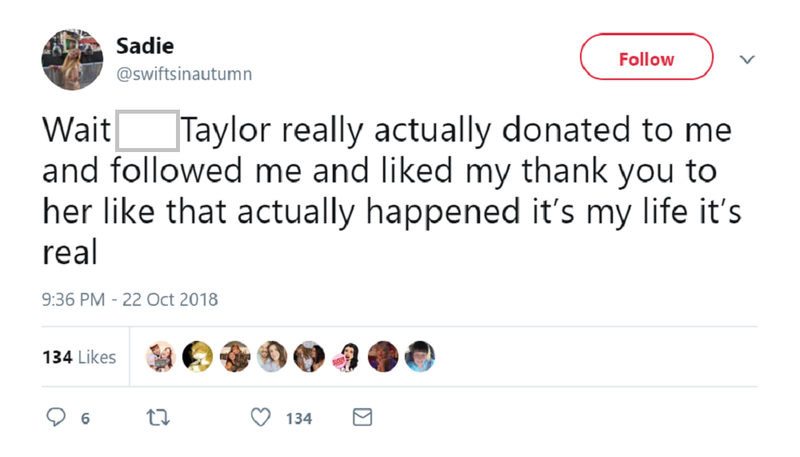 Although initially in disbelief, she thanked Swift for donating to her mother’s crowdfunding and even following her on Twitter after doing so. She also wrote a lengthier post on her Facebook where she described Swift as the light at the of the tunnel and a miracle to her life. She also mentioned how she’s been a Swiftie for so long, the singer’s even affected her entire life even before receiving the donation. 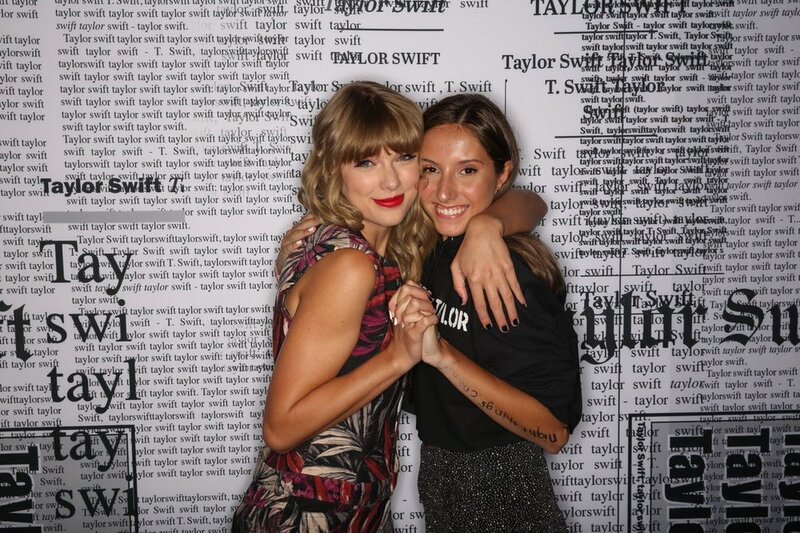 Swift with a fan at a photo booth during her Reputation album tour. Swift’s kindness to the Bartells is definitely not an isolated one. The Grammy award-winning musician is one of those few celebrities who make sure to keep a somewhat personal relationship with her supporters. Swift has been known to invite some of her most loyal fans to her own home to listen to her new records even before they hit the physical and online music stands. What more, the busy musician is always game to take pictures and even give out merch to the fans she meets both during tours and on the streets.